The Life of Anne Boleyn – When the Ordinary Feels Extraordinary! On 19th May, we remember Anne Boleyn. As a lover of Tudor history, you will know all about the dramatic events that so defined Anne’s tragic end. But what about the life of Anne Boleyn? For me, the 19 May is a day to celebrate that life, and whilst her extraordinary story has often been explored in detail, perhaps fewer of us are familiar with the ordinary; the way in which Anne Boleyn spent her days as queen. This is what I would like to share with you in today’s blog post. As a tribute to Anne Boleyn, here is an ordinary day in her extraordinary life. Let’s walk in her footsteps and get up close and personal with the daily past-times of this iconic, Tudor queen. When I started to write Le Temps Viendra: a novel of Anne Boleyn, this was largely uncharted territory for me. I had to educate myself about how a Tudor noblewoman would occupy her days at court. With the In the Footsteps, book countless hours spent reading contemporary letters, spoke often of the rhythms of court life, providing tantalising glimpses of everyday activities, and conversations, which bring us to a different level of intimacy with each of Henry’s wives. In this post, we will focus upon the account of Henry and Anne Boleyn’s visit to Gloucester and the surrounding area in the summer of 1535, recorded in the Corporation of Gloucester records. These records are unique in that they provide a contemporary, day by day account of how the king and queen were received into the city, who they met, where they visited in the area, and even gifts that they exchanged with the townsfolk of Gloucester. We shall use this as a backdrop to describe a typical day at the itinerant Tudor court. So imagine now that you are one of Anne’s ladies-in-waiting, a married noblewoman and a close personal friend of the queen. As such, you serve Anne at her most intimate tasks. Now, it’s time to get close to the real life of Anne Boleyn! Your first duty is to present yourself at the queen’s chambers before Anne rises. A little meat, bread and ale would be brought up to the queen’s chambers by her chamberers, allowing Anne to break her fast. Clothes are delivered upstairs from the queen’s wardrobe, both of which you accept at the entrance to her privy rooms, your status allowing direct, personal contact with the queen. All that remains of the Abbott’s Lodgings, Gloucester. You are staying in the abbot’s lodgings, within the precinct of the medieval abbey. Here, in the suite of chambers set aside for Her Grace, you attend your mistress in her raying chamber (Tudor speak for ‘Dressing Room’), assisting Queen Anne to dress for the day ahead. Let us imagine the sun streaming in through a mullioned window, falling upon Anne’s olive skin, as you help each layer of the queen’s gown to be laced and pinned into place over her linen smock. This undergarment is worn next to skin, protecting it and absorbing perspiration. As befitting Anne’s social rank, it is finely embroidered with gold thread around the cuffs and collar. Her scarlet petticoat and stockings come next, the former tied beneath a farthingale of similar colour. Afterwards, your fingers work nimbly to lace over it a long-sleeved kirtle, a rich garment fashioned from gold damask, and as it is the height of summer, the queen has chosen a light, outer gown, of the English style, made from crimson taffeta. Having dressed and heard the Mass in her privy closet, Anne sweeps downstairs to meet with the king and a small riding party that will accompany the royal couple on their day’s hawking. You fall into step behind her, the swishing of your skirts accompanying your progress. 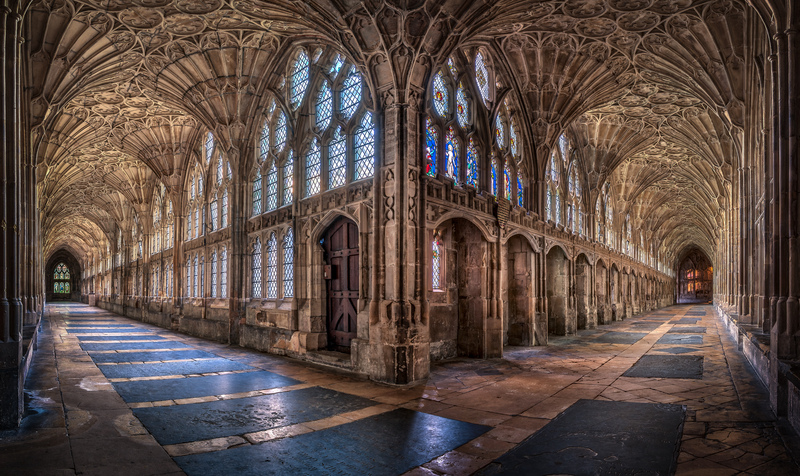 Riding out alongside several of Anne’s ladies, and a similar number of gentlemen from the king’s privy chamber, are the king’s Secretary, Master Cromwell; the king’s illegitimate son, Henry Fitzroy; Abbott Parker of Gloucester Abbey and the mayor of Gloucester, John Falconer. In the abbey yard, the townsfolk have gathered and present the king with ten fat oxen. Henry gives them thanks, then raises his hand to signal the departure of the royal entourage. Soon the narrow streets of the bustling town give way to fine, English pasture, gently warmed by the midsummer sun. Travelling in a southerly direction, the broad base of the Severn Valley eventually begins to rise sharply toward Prinknash Abbey (pronounced ‘Prinnash’), one of the country residences of Abbott Parker. Prinknash Abbey, Gloucestershire. Likely one of the places visited by Henry VIII and Anne Boleyn during their stay in Gloucestershire. Anne rides her horse skilfully, seated side-saddle by her husband’s side. From time to time, the king orders that the party stops to hawk. Anne takes her turn to accept a small bird, called a merlin, also known as ‘the lady’s bird’ on her gloved fist, skilfully casting the bird into flight in order to catch its prey. After falconers have retrieved the quarry from the bird’s razor sharp claws, the entourage continue to make their way through leafy lanes and woodland bathed in dappled light. Eventually the king and queen arrive at Prinknash, a fifteenth century manor house, fashioned from typical honey-coloured Cotswold stone. Here the abbot extends his hospitality, offering refreshment before you head off once more, a short distance to the south, to the village of Painswick. You soon realise that Painswick is a prosperous medieval village sitting pleasantly amongst rolling pastures and wooded escarpments. On the edge of the village lies the Lodge, another magnificent manor house, jointly owned by Lord Lisle and Sir John Dudley. Lord Lisle is away on business, and it is Sir John who welcomes his sovereign lord and lady with a lavish dinner, held at midday, as is customary. It is only later in the privacy of the queen’s privy chambers, that Anne herself speaks to you of court gossip, and you learn how the manor and its lands are much coveted by the likes of Master Cromwell and Sir William Kingston; for its income is generous, the pastures grazed by sheep for wool, its valleys covered with valuable oak forests. After dinner, you walk with the queen in the garden, whilst inside the king transacts business with Sir John, for there is a dispute about the felling of trees in the surrounding parkland. But the summer days are long and the king eager to continue the hunt. With business concluded, there is more hawking to be done. In the mid afternoon, you mount your horse once more and set off to Longridge Wood set high on a ridge overlooking the manor and village of Painswick. There you hawk once more. The queen is in excellent spirits, she laughs aloud at a private exchange between her and her husband, who lifts her gloved hand to brush his lips across it. Anne’s eyes sparkle like diamonds in return, captivating the soul. You reflect on how you have not seen the king and queen so merry since the haunting stillbirth of the queen’s second child almost one year ago to the day. You are happy for her, relieved to see their intimacy rekindled once more. And so the rest of the day slips away; the royal party gradually wending its way back toward Gloucester. You have been out for nearly twelve hours, and as you approach the city gates, the light is fading fast. Torch bearers greet the king and queen, lighting the way back to the abbey precinct. The flames cast a welcome glow to chase away the dark as Anne glances in your direction. She looks so radiant, as if she wants to share a secret with you. And indeed she does, for once you are back within the abbot’s lodgings, the queen tells you that you must make her ready, for the king wishes to lie with her that night. She squeezes your hand and you feel her joy, for it has been many months since the devastating end to her second pregnancy drove the king into the arms of the ‘Imperial Lady’ and left Anne’s bed cold. And so you, and another of the queen’s ladies, prepare her for bed; unlacing and unpinning all Anne’s garments, leaving her to sleep only in a smock, her lustrous auburn hair plaited up and tucked beneath a fine linen coif. Just as your mistress and friend slips into bed, there is a knock at the door and the king, your sovereign lord enters. Without thinking, you lower your eyes and dip into a deep curtsey before being dismissed. Leaving the room, you close the door with a click of the latch leaving your mistress to secure her happy future. And so ends a typical day in the life of Anne Boleyn; an ordinary day, and yet to you, completely extraordinary, a time traveller at the heart of the Henrician court. If this has inspired you to visit any of these places, you will them detailed in full in ‘In the Footsteps of Anne Boleyn‘. If you would like to read about the ‘Surprising Truth about the Last Moments of Anne Boleyn’, follow this link.